A prediction market is a collection of people speculating on future events or outcomes. These events include (but are not limited to) elections, sales of a company, price fluctuations of commodities, even changes in the weather and just about any event or outcome that can be objectively verified ex post. Prediction markets are basically event derivatives, where the value of the derivative will almost perfectly reflect the probability of an outcome materializing. Prediction markets have been in existence for decades, but with blockchain-related inventions (decentralized governance models, smart contracts, etc.) leveraging the concept, a new level of excitement about prediction markets has been reached. Why are prediction markets necessary? The main purpose of prediction markets is the aggregation of beliefs over an unknown future outcome. Because they incorporate a wide variety of thoughts and opinions, prediction markets have proven to be quite effective as a prognostic tool. Thus, these markets can directly advise important policy decisions, by giving more accurate estimates of the aggregate consequences of those decisions. Prediction can be made for varying reasons including hedging against undesired events, insurance purposses or pure speculation. But it’s clear today that the potential impact of this concept could go far beyond betting. 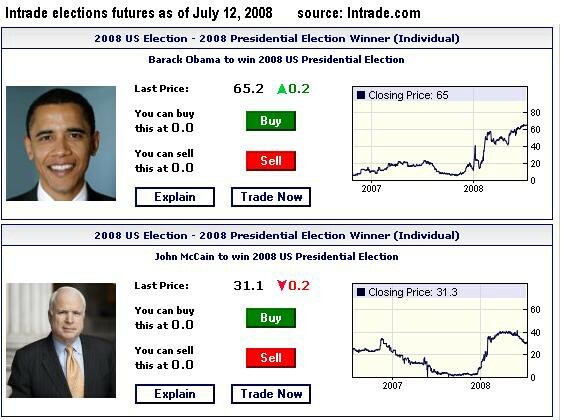 The classic example often used to explain the value of prediction markets are political elections. Prediction market platforms allow to create a poll-like market where the participants can trade the outcomes of an election similar to sports-bets. So if a business owner thinks that a certain politician being elected would negatively affect the revenue of his business, he could bet on the event of a successful election and thus hedge against the disadvantageous outcome. Individuals are also enabled to take advantage of proprietary information on a future event or outcome and turn it into a profit without revealing the source or content of the information. Thus, prediction markets allow for the aggregation of information that would usually not be shared and allows for more accurate predictions. Does this sound too abstract? Imagine this: In your typical corporate meeting on the next year’s sales forecasts, there are people from different corners of the company, each having their very own insights on the topic. However, these people are usually adversely incentivized to share their knowledge. This might affect the marketing lead to estimate the sales too high in order to secure a larger marketing budget or the sales lead forecasting too low in order to set the bar low (“underpromise and overdeliver” being a known mantra with these folks). Asking employees to forecast the sales and having part of their bonuses depend on the accuracy of the prediction (essentially creating a miniature prediction market) incentivizes the aggregation of this previously covered knowledge. Additionally, Prediction markets can be used to speed up decision-making processes in politics or organisations. With individuals being financially incentivized to predict the outcome / decision most likely to find consensus among all stakeholders, solutions can reach consensus much more efficiently. This is because the fight for personal interests in a decision-making process gets balanced out by an economic self-interest of predicting a consensus-reaching alternative. This is basically “forcing” opposing parties by financial incentivization to discover the middle grounds instead of reaching this point through time- and ressource-intensive rope pulling. Potentially even further affecting the way decision and politics are done is the concept of Futarchy, a governance model building on the capabilities of prediction markets. In this model, introduced 2013 by Robin Hanson, decision makers do not directly vote on policies but rather on desired outcomes (or “KPI’s” for the management folks out there). Prediction markets are set up for various policies to predict which policy is likely to have the highest impact on this metric which will be the one that actually gets implemented. How do prediction markets work? To further simplify this case, let’s say it is only possible to participate in this market using US Dollars. After the market is set up, participants can invest for example $100 and receive 1 “A-token” and 1 “B-token” in return. Both types of tokens automatically pay out $100 each in the event that the respective outcome happens. If the outcome does not happen, $0 will be paid out for this type of token. So if no action is taken, $100 (the initial investment) will be paid out with a 100% certainty. However, these tokens can also be sold freely with other participants. So similarly to how stocks represent the aggregated investors’ prediction on a company’s future performance, these outcome tokens will be priced according to supply and demand and represent the aggregated probabilistic predictions of the respective event. For example, “A-tokens” could be priced at $65 while “B-token” trades at $35 This can be read as a 65% probability that Candidate A gets elected versus a 35% chance of Candidate B taking over the office. If anyone disagrees with this probability distribution, he is economically incentivized to buy the (subjectively) undervalued or sell the overvalued token which will both have an effect on the price. As time goes by and more and more people buy and sell the tokens, the prices will fluctuate depending on the combined information held by market participants. Studies have shown that these prediction markets are actually more accurate than extensive polls when it comes to political elections. Who decides on the outcome of a prediction market? Here’s where so-called oracles come into play, which can be seen as unbiased “judges”. 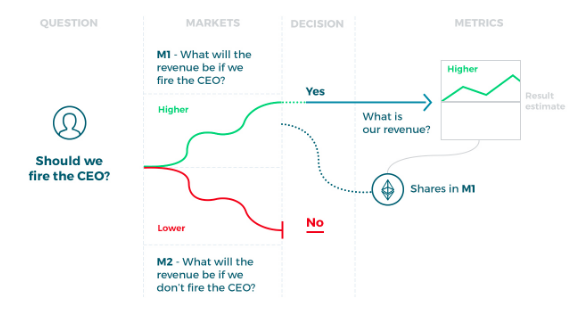 In traditional centralized prediction markets, the company running the market would fill the oracle role when the event has occurred and pay out the profits to the correct predictors. In decentralized prediction markets, oracles are needed to submit and verify information on real-world events & outcomes to the blockchain for the smart contracts to initiate the right payouts. Oracles can come in different forms such as software, hardware, or humans and can be centralized (trusted parties) or decentralized. We recommend this article for more information about the different kinds of oracles. Oracles are a highly interesting field of study by itself as they are not only crucial for prediction markets but can also connect any kind of smart contract with the real-world. Do scalable decentralized prediction markets exist? Gnosis Olympia is an alpha version of Gnosis’ upcoming prediction market, enabling its participants to try out the user interface and take part in non-monetary predictions on various topics using Olympia’s official play-money token OLY. Gnosis is oracle-agnostic and allows market-creators to choose their own oracles (centralized or decentralized) using a oracle platform. 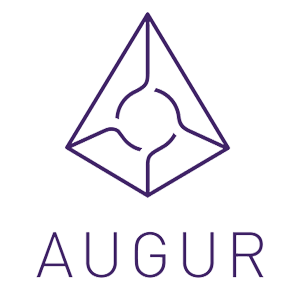 Augur is a decentralized oracle and prediction market platform. Users feed real world information into Augur’s contracts. Augur ensures the accuracy of this real world information by providing a financial incentive for REP token holders to correct markets they believe have been reported on incorrectly. In other words, Augur develops governance mechanisms in order to create decentralized oracles that verify events. All current project still operate in a testnet environment and/or have limited scale so far, but this is likely to change within the next 12–24 months due to the increase in interest and technological advancements in this field.